Dyno-Rod is the UK market leader in drain services. With 50 years of expertise, our reputation has been built on a commitment to service excellence and the ability to provide a solution to virtually any drainage problem. An emergency with your drains can feel like a disaster, with water or sewage flooding your home or garden. Dyno-Rod engineers respond rapidly, 24 hours a day, 7 days a week to fix your problem fast, safely and effectively. 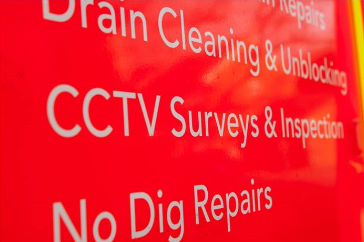 From dealing with blockages to installing new drains without digging, we do it all. Call us now on 0800 084 1355. UK market leader in drains services with 50 years experience , 24/7 emergency drain unblocking , drain repair using no-dig technology, round the clock customer helpline - call , CCTV surveys and inspection, high pressure water jetting, drain and pipe cleaning, blocked sinks, toilets and showers fixed fast, local expert, CRB checked engineers, fixed prices, obligation free quotes, no call out charge, domestic and commercial drain services, prevention against fats, oil and grease blockages, simple blockages to new drain installation, regular expert drain maintenance checks, long-term solutions to persistent drain blockages and all work guaranteed. The UKSTT, (The United Kingdom Of Trenchless Technology), The NSA (The National Sewerage Association) UVDB and UVDB Verify (Utilities Vendor Database), ISO 9001, BSIA (British Security Industry Association), SBWWI (Society Of British Water &amp; Wastewater Industries). Found this company online and after getting quotes from other local drain cleaning companies decided to go with these. The men who cam out were very polite and professional and showed me the source of the problem. Once the drain was unblocked they cleaned up after themselves. Would not hesitate to use again! I was very disappointed with the outcome of such a popular service and would not recommend to you or a friend, it certainly ISN'T VALUE FOR MONEY.